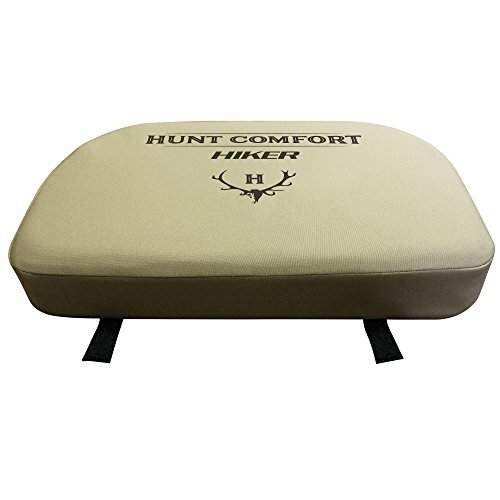 The Hunt Comfort Hiker Gel Core Hunting Seat designed to place all day comfort where it is needed the most. Hiker is made with specially designed waterproof 338 fabric, capable of enduring seasons of hunting duty while improving the enjoyment of every hunt. Gel Core formula provides state of the art comfort created by two embedded elliptical gel pads in specialized, high resiliency polyurethane and medical grade foam. Built to reduce and gently distribute your seated pressure. Helps to eliminate the annoying pain and nerve compression that comes from sitting still, so you can enjoy your precious hunting time and forget about hurting. Specially designed to replace most traditional climbing stands and hang-on seat cushions. Comes with four Velcro loops sewn in for easy attachment to your stand. The Hiker comes with 3 year total quality warranty and lifetime cushion core warranty. Season after season, Hunt Comfort frees hunters from the annoying distractions of discomfort. We make keeping still and quiet easy, and that leads to hunting success. If you have any questions about this product by Hunt Comfort, contact us by completing and submitting the form below. If you are looking for a specif part number, please include it with your message.